Lifestyle interventions for the prevention and treatment of coronary disease. In comparison with advice to follow a ‘low fat’ diet (37% fat), an energy-unrestricted Mediterranean diet (41% fat) supplemented with at least four tablespoons of extra virgin olive oil or a handful of nuts (PREDIMED) achieved a significant 30% (number needed to treat (NNT)=61) reduction in cardiovascular events in over 7500 high-risk patients. Furthermore, the Lyon Heart study showed that adopting a Mediterranean diet in secondary prevention improved hard outcomes for both recurrent myocardial infarction (NNT=18) and all-cause mortality (NNT=30), despite there being no significant difference in plasma low-density lipoprotein (LDL) cholesterol between the two groups. It is the alpha linoleic acid, polyphenols and omega-3 fatty acids present in nuts, extra virgin olive oil, vegetables and oily fish that rapidly attenuate inflammation and coronary thrombosis.6 Both control diets in these studies were relatively healthy, which make it highly likely that even larger benefits would be observed if the Mediterranean diets discussed above were compared with a typical western diet. A high TC to high-density lipoprotein (HDL) ratio is the best predictor of cardiovascular risk (hence this calculation, not LDL, is used in recognised cardiovascular risk calculators such as that from Framingham). A high TC to HDL ratio is also a surrogate marker for insulin resistance (ie, chronically elevated serum insulin at the root of heart disease, type 2 diabetes and obesity). And in those over 60 years, a recent systematic review concluded that LDL cholesterol is not associated with cardiovascular disease and is inversely associated with all-cause mortality.8 A high TC to HDL ratio drops rapidly with dietary changes such as replacing refined carbohydrates with healthy high fat foods. Compared with physically inactive individuals, those who walk briskly at or above 150 min/week can increase life expectancy by 3.4–4.5 years independent of body weight.9 Regular brisk walking may also be more effective than running in preventing coronary disease. And just 30 min of moderate activity a day more than three times/week significantly improves insulin sensitivity and helps reverse insulin resistance (ie, lowers the chronically elevated levels of insulin that are associated with obesity) within months in sedentary middle-aged adults. This occurs independent of weight loss and suggests even a little activity goes a long way. Another risk factor for CHD is environmental stress. Childhood trauma can lead to an average decrease in life expectancy of 20 years. Chronic stress increases glucocorticoid receptor resistance, which results in failure to down regulate the inflammatory response. Combining a complete lifestyle approach of a healthful diet, regular movement and stress reduction will improve quality of life, reduce cardiovascular and all-cause mortality.10 It is time to shift the public health message in the prevention and treatment of coronary artery disease away from measuring serum lipids and reducing dietary saturated fat. Coronary artery disease is a chronic inflammatory disease and it can be reduced effectively by walking 22 min a day and eating real food. 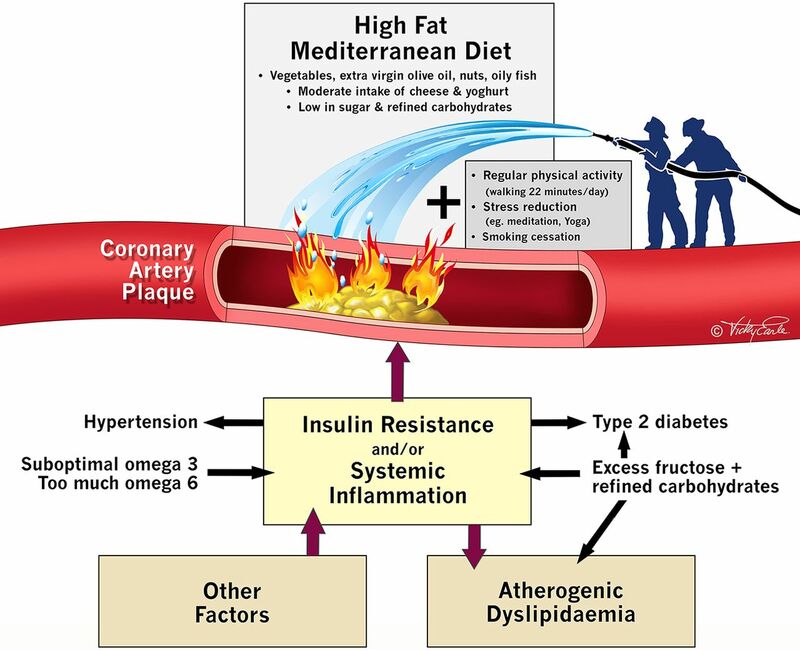 There is no business model or market to help spread this simple yet powerful intervention.
. Dietary fats, carbohydrate, and progression of coronary atherosclerosis in postmenopausal women. Am J Clin Nutr 2004;80:1175–84.
. Too toxic to ignore. Nature 2012;490:169–71. Contributors AM wrote the initial draft with further revisions and edits from RFR and PM. Competing interests RFR served as a consultant for one day in May 2015 for Amgen. AM is a co-producer of the documentary The Big Fat Fix.